Update: I wanted to update this list so that we don't waste wants on something that is 'OK'. The rear hatch was moved down to not required as I just found out that we can run a 6" hatch in the rear. It would be great if it were a 8" hatch but I am ok with not making it required. I also moved the paddle issue down to not required as I have seen a lot of ways to skin that cat. A few bucks for a paddle holder would go along way for this one. I rented an Outback and a Revo 11 today (Revo 13 and Compass last week and Revo 11 and Compass the week before that). The Outback ran nice but it had a major problem (rudderless tracking) that the Compass does much better. Unfortunately the Compass is lacking a few details. I figured I would start off a 2019 wishlist. I sold all my Kayaks and now researching to find a few kayaks for the family. Hobie, the compass should be the new hull design that Revo and Outback move to. 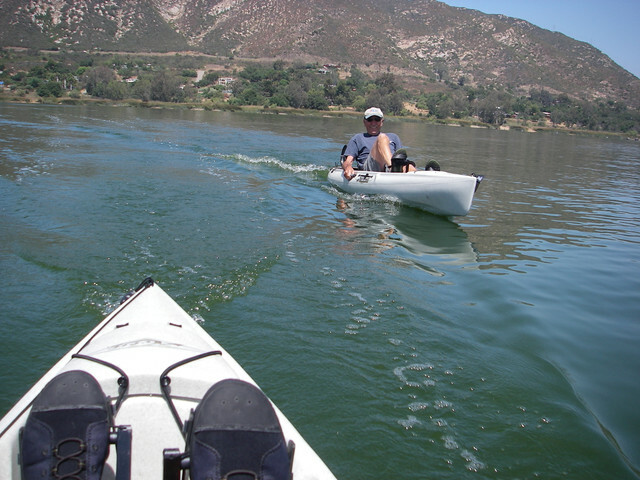 The ability to paddle the kayak without the rudder down is a MUST have (at least for me). My wife and I spent a good 10 minutes bumping into the kids and each other because we were trying out the tracking with the rudders up. It was comical until I realized that if one of us broke a rudder way out on the large lake we would have been in trouble with the kids. Revo and Outback are both on my list of boats that I won't touch now. Hobi Wan Compass you're my only hope! With that said here is my wishlist for the 2019 Compass. Note: I swapped the Vantage CT seat out on the Compass and noticed that the seat is much narrower. I also noticed that the seat post on the Revo 11 is roughly the same length as the space between the seat posts on the Compass. If a person were to get the seat post and screw it directly into the seat posts on the Compass it would just about clear the rear when using the higher setting on the back of the Vantage seat. The vantage seat, after installed, would leave enough room to mount two H-Rail handles between the Compass molded in seat posts. 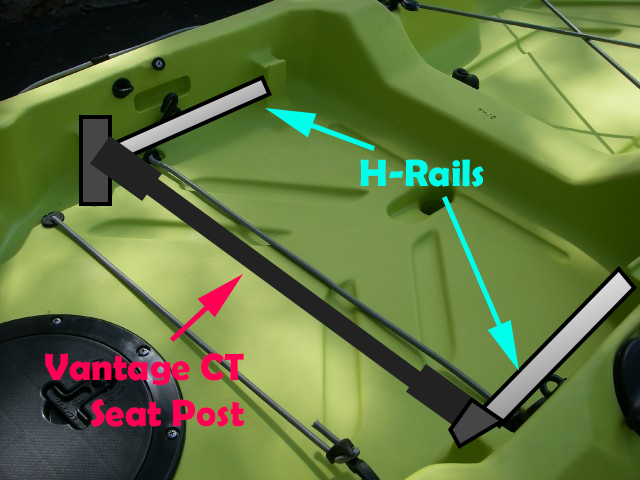 Yak handles like that would give you excellent support and would give someone the ability to connect rods or cup holders directly to the H-Rail (Mocked up a photo of what I am talking about). If you want to keep your 'Entry' level title on this yak I would be completely satisfied if you made an upgrade kit that dealers could get. 2. Rear Rails (The attachment points are limiting. I want to decide where to slide the rear bungees.). 3. Please fix that paddle holder so I don't break a finger trying to get the paddle secured. I saw a great design where the paddle inserted directly into the handle (brilliant design). 5. More Room (The compass has way more room for standing vs the Outback but I like to see a bezzless design like the big brother PA12. The Compass standing is a bit too high from the water as it makes standing a bit hard for taller people. This one is probably more of a long term item as I doubt you will change the compass design that much. I could see the Compass turning into a PA12 (Light Version). The demand for this market is pretty big but most of the dealers haven't nailed it yet. The closest thing I have seen is the Topwater PDL Angler or Radar 115 but without the Mirage drive it's going to take a lot for me to go the prop drive direction. If you added all the required items for the same price as the Outback, I would take 2 today. My 2 cents. Last edited by GunTotnHippie on Fri Aug 10, 2018 1:18 am, edited 16 times in total. I would say to exclude the 180 drive forever, and add a mast socket. BTW new models come out in Sept but seemed to be leaked at a show in July. I watched that video. Glad they acknowledge the wants of the customers. Adding mast to the list. I forgot that one! My wife and I spent a good 10 minutes bumping into the kids and each other because we were trying out the tracking with the rudders up. It was comical until I realized that if one of us broke a rudder way out on the large lake we would have been in trouble with the kids. It's absolutely true that the Revo 11 and 13, Outback and Sport don't track well with the rudder up. They were actually designed that way on purpose to enhance handling with the rudder. The Revo 11 and 13's paddling counterparts, Quest 11 and 13 do track, but of course don't have the Mirage Drive. So I'm wondering why you would want to buy a boat with a rudder and not use it? All the boats track pretty darned well with the rudder down. I paddle the Revo 11 with rudder and it tracks beautifully once the rudder is set, and still edges for minor course corrections without having to touch the rudder. If your rental boats didn't have properly adjusted rudders (no line slack when straight) you might not have had that experience (loose rudders require constant correction -- a huge pain when paddling). Is it because you're concerned about rudder failure? The Hobie rudder system is pretty robust with the weakest link designated as the rudder pin. Hobie includes a spare with each boat, just in case. You might also be interested to know that if you're willing to pedal with a rudder failure, your paddle makes a respectable substitute. Finally, if all else fails, the boats track quite well backwards with the rudder up (the bow subs as a skeg). If you don't have the MD 180, simply turn your Drive around and reinsert, using your paddle for course corrections (and look behind you). Concerned about shallow water? You can shorten the large rudder and still use it down to about 10 or fewer inches and still have excellent rudder authority. The Compass is a great boat design, but perhaps you noticed that the reason it tracks better than the others is the rudder is down -- doesn't track as well with the rudder "trailing" (though somewhat better than some). One last thought -- the Revo 16 actually tracks manageably with the rudder up and has all your listed "required" items. You might give it a try. So, not trying to derail your wish list, but perhaps you have more options than you thought. I tried the compass with the rudder up and didn't notice a problem but I wasn't looking for that since I initially assumed that all the Hobie yaks would track somewhat straight when paddling. I get why they designed it that way. My wife tried the Revo 11 and she just sat there spinning and running into everyone. It was pretty funny watching her. I am hoping that the Compass will track better than the Revos and Outback. As far as repairing I am sure we can stock a few more parts but we live on a river which gets pretty low this time of the year. The last thing I want to have to worry about is dropping and lifting a rudder. I have 4 kids so keeping them from lifting or lowering their rudders will be a bit of an issue. The compass rudder will bounce back up and down after hitting something. The Revo 16 is too large for us. 12' or less and less than 80lbs is where we really need to be for the back of our truck and what I feel comfortable lifting (6 in our family and we need 3 pedal drives and I am lifting them all). Yes, the Revo 11 is impossible to direct going forward without its rudder -- just goes in circles. The last thing I want to have to worry about is dropping and lifting a rudder. I have 4 kids so keeping them from lifting or lowering their rudders will be a bit of an issue. The compass rudder will bounce back up and down after hitting something. The Twist N Stow rudder does the same thing. I've been using it since it came out 12 years ago and haven't broken one yet. It gets locked down to keep it in place, but I've hit rocks, logs and other structure with it on several occasions. It just rides up over it and re-seats. If you have occasion to rent another Revo, try it on a boat ramp or whatever you can find. If you're looking at multiple boats, you might want a variety anyway. The compass, no doubt, would be a great candidate, but it would be nice to have some options, especially if Hobie-Wan comes up short in the requirements list!